Printing & Converting - Sage Automation Inc. 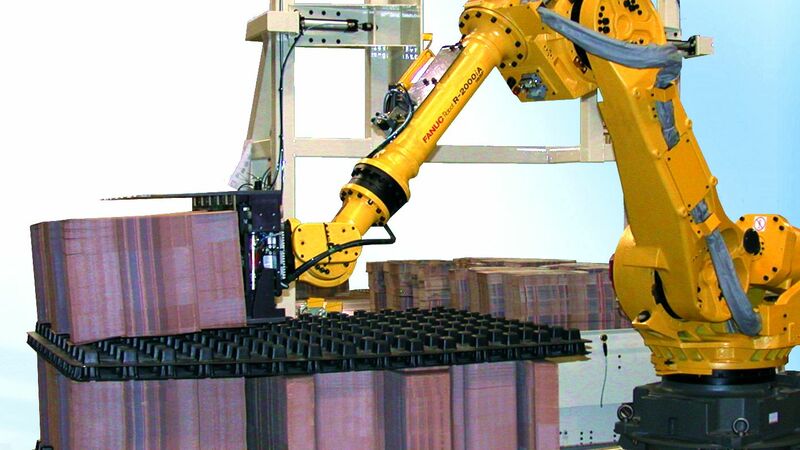 The pictured Fanuc robot with a custom fork-n-clamp end of arm tool palletizes stacks of flat cartons. Sage builds the complete system, with automatic pallet handling, automatic slip sheet handling, conveyance of product as well as final built loads. Sage has many years of experience automating load building and depalletizing in the printing and converting industries. This system palletizes various paper/card stock materials that can be irregularly shaped. The fork and clamp on this system picks only from the back side so nesting the various stacks is not a problem. This end of arm tool is multi-functional as it can pick slip sheets, dividers, and the product with ease. This Open gantry is just one example of the custom automated material handling systems that Sage Automation has built recently. Sage can custom build an industrial automation system to meet your specific requirements.